"Fake news" refers to liberal bias in the media that is so misleading that it is actually false. It can also include assertions of a non-political nature that seem believable but are untrue. Generally, fake news falls into two categories: mainstream fake news with a liberal bias that goes beyond reporting of facts and commentary; it can take the form of headlining a manufactured crisis to obscure real news in the daily news cycle. The other category is clickbait - a sensational headline with a body of reporting based on half-truths designed to lure a reader into a commercial website. The motive of fake news is to manipulate public opinion using false reporting and bias. It can be sourced by anonymous government leakers or political operatives. The motive can be as simple as confirmation bias – pandering to an ideological viewership to distribute talking points or maintain ratings. the New York Times story that the investigation of President Trump began after James Comey was fired and not in the Spring of 2016. On the day documents were released verifying that the late Sen. John McCain was a major player in the coup plot against President Trump, the MSM reported Trump's reaction as if it were some petty vendetta related to McCain's POW status or McCain's vote to save Obamacare. Political fake news is designed to push an agenda, typically the liberal one. Non-political clickbait is designed to attract internet traffic, attention, or sales. Clickbait websites often lack known publishers hindering lawsuits against them for libel or slander. In many cases, clickbait websites resolve to IP addresses located outside the United States. 3 President Trump and "fake news"
"News articles" that are completely fictional have a long history. The motivation is often for the amusement of the author, or the desire to make money by selling the newspaper or handbill based on its entertainment value. Such "news articles" are sometimes purely satirical (something that has a long history), or intentionally malicious, often for political reasons. For example, malicious claims about Presidential candidates (illegitimate children, etc.) have a long history in the United States. The falsehoods have sufficient emotional impact to assure that they will be magnified in various mediums. It is debated whether or not this includes satiric news. Walter Lippmann, a prominent socialist, indicated that the press is supposed to utilize fake news to spin a narrative and thus manufacture public consent, claiming that news and truth are not the same thing, that it requires no real training to deal with the small pool, and that everything else is in the journalist's own discretion, which includes even promoting stereotypes. The explosive growth of the internet in the early years of the 21st century and the political divisiveness of the 2016 Presidential election saw explosive growth in fake news, far beyond supermarket tabloids, and the use of the term "fake news" to describe this. In the more recent past, but before the advent of the widespread propagation of false information through the internet, the most visible instances of "fake news" were the "supermarket tabloids" ("rag mags") that could be found at checkout counters of supermarkets. These were often full of blatant nonsense, and (nearly) everyone knew that, and bought them only for their entertainment value. Perhaps the most blatant of these was Weekly World News, which seemed obsessed with some half-human half-bat creature named "bat boy," and with extraterrestrials. They sometimes devoted entire issues to extraterrestrials, and, in one instance, had three articles relating that each of the Presidential candidates in the 1992 Presidential election (George H. W. Bush, Bill Clinton, and Ross Perot) had been taken for a personal ride in a flying saucer to see Washington, D.C. from the air. These fake articles continue, often with an extreme political slant. Recent issues of the National Enquirer (perhaps the most blatant fake newspaper since the demise of Weekly World News) had completely false articles about Special Forces raids, carpet bombing, drone strikes, and naval assaults by American forces in the Middle East. The Globe has run headlines alleging that Hillary Clinton is a Russian spy and has a "new treason indictment", which is not supported by the corresponding article. Another headline, unsupported by any evidence in the article, stated that Hillary Clinton and Huma Abedin were stopped trying to escape from the country. And there were numerous headlines during the 2016 Presidential campaign stating that they were in possession of evidence that would put Ms. Clinton in prison. The false claim, based on manipulation of the data, by Sir Arthur Eddington that the 1919 total eclipse of the sun proved the General Theory of Relativity. The false reporting by the bigot H.L. Mencken on the Scopes Trial. The War of the Worlds broadcast on Halloween night, 1938, in which Orson Wells dramatically described an invasion by hostile Martians in New Jersey. The fake claim that President George H. W. Bush did not know what a grocery scanner was, implying that he was out of touch. Cybersecurity experts began using the term "fake news" to describe social media postings that attempted to spread false information regardless of the political ramifications of its content. The widespread public use of the phrase by non-experts probably originated on November 14, 2016, in an announcement by Google. They said their advertising service was being pulled from sites whose purpose was to present as news what was solely designed to attract attention rather than conducted in a factual manner by a responsible party. Fake news is also a form of "click bait". A photo would appear in an ad implying that there was a news story about the death of a celebrity, and computer users would click on the link to be taken to a website that carried heavy advertising, but no news story about the death of the living celebrity. Ultimately, a judgment about fake news rests on the reputation of its author, and the reputation and editorial stance of a news organization or book publisher. Longevity is not in and of itself proof a publication or publishing house is an established reputable service. Newsweek magazine, for instance, was once established as a "moderate" or right-leaning weekly news source to counter the perceived leftwing bias of Time magazine. It has since ceased publication as a print journal, and the name - Newsweek - was sold as an established, existing tradename, only to reappear online as a mainstream news source for some of the most outrageous left-wing lunacy. In the United States the New Republic, established before World War I, is considered the granddaddy of modern liberal thought, whereas the National Review established in the 1950s is considered its modern conservative counterpart. The Nation has long been deemed the voice of more marginalized progressive thinking. While staff management and editorial views have evolved over many decades, any author moving from one of these publications to another generally have professional reputations as traditional ethical journalists, unlike modern broadcast journalists, or what passes as "ethics" taught in some of the nation's most prestigious journalism and broadcast schools today. Among book publishers, St. Martin's Press is considered a mainstream book publisher for Democrats which no other mainstream publisher would stake its reputation on, and Regnery is considered its Republican counterpart. The challenge for young readers is to discern good, solid, factual reporting in the internet era, at a time when an explosion of anonymous blog sites are threatening the existence of a dying print and cable news broadcast industry. Again the reputation of the author is all pervasive. This requires follow-up and holding the author (whether anonymous or a pseudonym) accountable, and not seeking confirmation bias in how a reader informs themselves. As can be seen, the reputation of a news organization or individual journalist can change over time, to either improve or lose credibility. The New Yorker for example, once had a reputation for vigorous fact-checking. However, after such stories on the credibility of Wikipedia, its fictionalized account of the death of bin Laden, its hit piece on the person and character of American Sniper hero Chris Kyle, and it's partisan, sloppy, and outrageous attacks on Brett Kavanaugh, have called The New Yorker's viability as a reputable source into question. Ronan Farrow, who writes for the New Yorker appeared as a bright and shining rising star in the field of investigative journalism, at a moment when public perception of journalists was at its lowest. Farrow fearlessly wrote about the deviant sexual predations of Democrat kingpins and mega-donors such as Harvey Weinstein and others, for which he won a Pulitzer Prize. Farrow even described the intimidation tactics wealthy predators use against female victims and himself by hired thugs and ex-intelligence agents to silence people. Farrow was a hero of the MeToo movement. Then Farrow tossed his reputation to the wind by signing his name to unsubstantiated smears, which his own reporting debunked, in a vicious partisan smear of Judge Brett Kavanaugh. Farrow sold out, and his actions now have the opposite effect of adding credibility to the defense and rehabilitation of Harvey Weinstein. A wrap up smear, also known as a circular reporting, circular journalism or an echo chamber, occurs when partisan sources leak false information to journalists then use those same published accounts to validate their claims. Several instances in recent memory illustrate the technique during the Trump-Russia collusion hoax and the Kavanaugh smear. In Trump-Russia, a false allegation that Trump colluded with Russia was leaked by Democratic operatives to get news organizations to publicize the claim, then biased Obama administration employees used those news stories as supposed evidence to obtain FBI surveillance warrants on the Trump campaign. CNN, the Washington Post, the New York Times and numerous other organizations reported fabricated information by anonymous sources throughout 2016, 2017, and 2018. The published reports became the basis of the Trump-Russia conspiracy hoax and FISA abuse scandal. When mainstream media published the false information, the Obama FBI, Justice Department, CIA and DNI used the fake news (originating with themselves) as supposed corroboration from "independent journalists" to begin investigations, interviews, perjury traps, seek warrants, perform Gang of Eight briefings, and appoint a Special Prosecutor to pursue political objectives. Michael Sussmann who worked with the general counsel of the Clinton campaign and the DNC gave fake evidence to the FBI and New York Times that a webserver in Trump Tower was communicating with a Russian bank. The smears were found to be without foundation. Christopher Steele who worked for Hillary Clinton gave false evidence to the FBI and numerous mainstream media outlets that Carter Page was a Russian spy, when in fact Page was a former FBI informant who helped jail Russian spies. Steele gave bogus sexual innuendo about Trump to the FBI; DNI James Clapper leaked to CNN than that Trump had been briefed on the information, thus creating a "Breaking News" story. In the Kavanaugh smear, false sexual abuse allegations were leaked by Senate Democrat committee staffers to produce sensationalized headlines and martial public pressure in an emotional cause. Sen. Dianne Feinstein or a staffer leaked a letter from Dr. Christine Blasey Ford to the Washington Post alleging notes from a therapist and a polygraph exam were material evidence of a sexual assault, sparking a hue and cry on the Left for extended nomination hearings and FBI investigation of Judge Kavanaugh. The alleged "material evidence" was never provided to the FBI or Senate Judiciary Committee for examination and consideration, and the accuser caught in a series of conflicting sworn public statements. These mainstream journalists and news organizations in one capacity or other were willing participants in the Trump-Russia collusion hoax. The plan to exonerate Hillary Clinton of criminal charges, sabotage Donald Trump's election chances, and later his presidency, originated with corrupt elements of the Obama administration, in collusion with the Democratic party. Allies opposed to Trump's demand that NATO members give more to fund the alliance, and Russian sources feeding Democrats false information also contributed. Ken Bensinger, BuzzFeed reporter who received Steele dossier from David Kramer, Sen. John McCain's Chief of Staff. Ken Dilanian, NBC News. David Corn, Mother Jones. Michael Isikoff, Yahoo News. Ali Watkins, BuzzFeed and The New York Times. Brian Ross and Matt Mosk, ABC News. Carl Bernstein and Jake Tapper. CNN. Julian Borger, The Guardian. Peter Stone and Greg Gordon, McClatchy. Bob Little and Rachel Martin, NPR. Evan Perez, Jim Sciutto, Tom Hamburger, Rosalind Helderman, and Fred Hiatt, The Washington Post. Allan Cullison, The Wall Street Journal. Other willing participants were: The New Yorker, Huffington Post, Newsweek, MSNBC, Politico, Vanity Fair and Slate. All these continued to report the fake Russia collusion narrative even after it was thoroughly debunked, and none have issued retractions to their reporting. The uncorroborated allegations violated every tenet of traditional, respectable journalism. None of it would have been possible without the help of several global media organizations willingly publicizing the false narrative of Trump collusion with the Russian government. NBC News, The New Yorker, The Washington Post, Stephen Colbert, ABC News, CBS News, USA Today. The Washington Post, The New York Times, Cable News Network (CNN), The Guardian, National Public Radio, TMZ, Atlantic Media, Capitol Hill Publishing, Ann Cabrera (CNN), Sara Sidner (CNN), Erin Burnett (CNN), S. E. Cupp (CNN), Elliot C. McLaughlin (CNN), Amanda Watts (CNN), Emmanuella Grinberg (CNN), Michelle Boorstein (Washington Post), Cleve R. Wootson Jr. (Washington Post), Antonio Olivo (Washington Post), Joe Heim (Washington Post), Michael E. Miller (Washington Post), Eli Rosenberg (Washington Post), Isaac Stanley-Becker (Washington Post), Kristine Philips (Washington Post), Sarah Mervosh (Washington Post), Emily S. Roeb (New York Times), Maggie Haberman (New York Times), David Brooks (New York Times), Shannon Doyne, Kurt Eichenwald, Andrea Mitchell (NBC/MSNBC), Savannah Guthrie (NBC), Joy Reid (MSNBC), Chuck Todd (NBC), Noah Berlatsky, Elisha Fieldstadt (NBC), Eun Kyung Kim, HBO, Bill Maher, Warner Media, Condé Nast, GQ, Heavy.com, The Hill, The Atlantic, Bustle.com, Kathy Griffin, Alyssa Milano and Jim Carrey. President Trump and "fake news"
For a more detailed treatment, see Mainstream media and Donald Trump. It has been confirmed that many fake news sites were actually created and managed by liberal Democrats ("false flag" operations) who support Hillary Clinton and oppose Donald Trump who engage in their deception in an attempt to discredit conservatives and Trump. One of them, Jestin Coler, a Democrat and Clinton supporter who owns the company Disinfomedia, runs several fake news sites that create "conservative" fake news stories. A topic of fake news stories after the 2016 election was whether there was violence between Trump supporters and opponents. After the 2016 election, several violent and disturbing anti-Trump attacks occurred throughout the nation against Trump supporters or supposed Trump supporters. Despite these attacks, liberals and leftists only focused on alleged "attacks" by Trump supporters against minorities and others (the leftist narrative, although being blatantly false and one-sided, fits their manufactured narrative that Trump supporters are "racist" and "evil" and that leftists are "tolerant" and "forgiving"). Fox News found that despite the number of real anti-Trump attacks which went largely unreported, several of the "pro-Trump" attacks were hoaxes. One widely shared fake story, spread by the mainstream media, that Trump's election had led to a rise in anti-Semitism by white supremcists—it turned out that bomb threats at a synagogue were actually carried out by "an African-American left-wing journalist" and a "Jewish teenager in Israel, with dual citizenship in the U.S."
Following the 2016 election in which Trump won, liberals, the mainstream media, and social media had misapplied the term "fake news" to make the false accusation that alternative news and Russian sources are "deliberately lying" to their readers, listeners, and viewers, and that these "lies" helped elect Donald Trump President of the United States. The liberal-pushed "fake news" accusations are a form of conspiracy theory. However, the mainstream media itself publishes and promotes fake news stories, from appearing in its nightly network newscasts, on its cable news channels, in its newspapers and on its websites (including Facebook). The MSM has allegedly been adopting safeguards to prevent itself from reporting fake news stories, but it has been unsuccessful based on more recent examples. No evidence has ever been presented the Russians, Russian entities, or the Russian government ever hacked, or attempted to hack, the servers of the Democratic National Committee. Russians did, however, make failed efforts to hack into the voter rolls of state election boards, notably those maintained by Georgia Secretary of State Brian Kemp. The Obama White House, however, at the direction of Susan Rice and others, conflated the issue of Russian attempted hacking of state election boards with the release of DNC emails by WikiLeaks. FBI director James Comey testified to Congress that the FBI never examined DNC servers to determine if they had indeed been hacked, and by who. Evidence suggests the public disclosure of John Podesta, Debbie Wasserman Schultz, and other Democratic operatives' emails came from an inside whistleblower source. Some speculate the inside leaker was Seth Rich, whose murder, like the DNC breach itself, was never fully investigated. The fake news narrative of "Russia hacked the DNC," was coined by a private security firm hired by the DNC after the security breach was discovered. The only known evidence that exists points to an inside leaker, who downloaded the DNC emails on a flash drive and likely forwarded them to WikiLeaks. The Washington Post reported in June 2017 of a meeting held between President Trump and Federal Communications Commission Chairman Ajit Pai that never occurred. Also in June 2017, The New York Times falsely stated that 17 U.S. intelligence agencies agreed with an assessment that Russia made hacks into the 2016 presidential election – the actual number was four, with one dissenting from the report's conclusions. The Associated Press reported, and retracted, the same falsehood. Obama Administration Director of National Intelligence confirmed that "the report itself makes it clear that it was the three agencies plus the Office of the Director of National Intelligence that put this intelligence community assessment together." In May 2018, left-wing activists and some members of the mainstream media, such as New York Times Magazine editor-in-chief Jake Silverstein and NPR, shared pictures of detained illegal immigrant children sleeping in cages and blamed the Trump Administration for it despite those pictures having been taken during the Obama Administration. An Associated Press report discussing alleged abuse at an illegal immigrant detention center left out the fact that Obama was president when the abuse happened. Other media sources have published fake news about President Trump's immigration policies. When President Trump criticized liberal environmental idiocy and forest management for failure to clean up fallen dead wood which provided the fuel for deadly California wildfires, mainstream fake news organizations reported it as if the President was criticizing firefighters. CNN reported the bald face lies that the President had "attacked firefighters" and was "threatening to withhold aid to the victims." Former FBI Director James Comey, during his testimony to Congress, debunked two fake news stories on The New York Times and CNN, respectively. After several inaccuracies and flaws were found in a CNN article that attacked Trump and his allies over a Russia fund, CNN retracted the article. Three CNN employees resigned due to the resulting scandal. 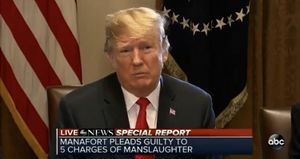 ABC News ran a banner headline claiming Paul Manafort pled guilty to five counts of manslaughter. The Washington Post falsely reported in August 2018 that the Trump Administration was denying passports to Hispanic Americans along the border with Mexico, and The New York Times falsely reported in September 2018 that UN Ambassador Nikki Haley spent $53,000 on curtains when they actually were approved during the Obama Administration. While many examples of fake news appeared during Donald Trump's presidency, the problem existed long before his election. One of the more infamous examples of fake news was when former CBS News anchor Dan Rather used forgeries of the Killian Documents on George W. Bush's service record in order to sway the 2004 election, which resulted in his firing after being exposed. See Rathergate for more details. Obama National Security Advisor Susan Rice putting out the fake news narrative that a planned terrorist attack and massacre of Americans was only a spontaneous riot spawned out of a peaceful demonstration. Obama National Security Advisor Susan Rice appeared on the five major network Sunday talk shows to put out an official fake news narrative that a terrorist attack against Americans two months before a presidential election was only a peaceful demonstration that turned into a riot. Despite evidence the contrary, many mainstream news organizations adopted the fake news narrative as fact for its viewers and readers and branded skeptics as conspiracy theorists and racists who opposed a black president. The most common example of fake news is the "click bait" ads that appear on social media sites saying "Hollywood prepares to say good-bye to [name of celebrity]" implying that the celebrity has just died. People then click on the ad to visit a website to learn about the celebrity's death, which boosts the number of page views on that site. However, the fake news will trend if more people start re-tweeting or sharing the item without visiting the underlying website in the belief that the celebrity has just died. Fake news is frequently used by radical Islamic terrorists to recruit new adherents. The terrorists will either create or embellish fake news accounts of anti-Islamic acts to radicalize members in target populations. For example, terrorists would spread news accounts of people urinating on the Koran at U.S. military prisons. Another fake news item was that a U.S. company was hiring mercenaries to kill ISIS militants. Again, the emotional impact of the fake news assured that it would spread quickly through social media. According to FBI cyber experts, during the 2016 presidential election, Russians used armies of Twitter bots to spread fake news using accounts that seem to be Midwestern swing-voter Republicans. Leading up to the March 15, 2017 election in the Netherlands, Russia was found to use social media to spread "fake news" to influence public opinion. One possible example of fake news was the announcement by the mainstream media that Fidel Castro died at age 90 on November 25, 2016. In fact, the Obama Administration and major news outlets were likely aware that Castro had died of a terminal illness many years earlier. Indeed, Obama did not even mention, let alone visit, Castro during Obama's visit to Cuba in March 2016, and neither the president, vice-president, or other high-ranking elected official of the United States attended Castro's "funeral". One fake news item from Freedom Daily in February 2017 was: "BREAKING: Federal Judge Just Officially Ruled CNN Is FAKE NEWS And Forces SHOCKING Punishment On Them!" However, this was a misreporting of a Georgia federal district court judge denying CNN's motion for summary judgment in a defamation action filed by a hospital executive against CNN. No "shocking punishment" was involved and the case will go to trial on the merits. A poorly-sourced February 4 Washington Post article claimed a feud existed between DHS Secretary John F. Kelly and Steve Bannon, when in fact, none existed. The article's author was forced to admit his error. In June 2017, the Associated Press reported, and later corrected, a story that EPA Administrator Scott Pruitt met with Dow Chemical CEO Andrew Liveris – something which did not actually happen. In November 2017, The Washington Post claimed that the conservative Breitbart News created the nickname "Mr. Perfect" when referring to Jared Kushner, while in reality, Kushner's own companies created the nickname to promote themselves in China. Also in November 2017, MSNBC's Morning Joe show was caught broadcasting a pre-taped post-Thanksgiving show while pretending on air to be broadcasting live. In April 2018, the Associated Press and The Washington Post falsely claimed that the NRA decided to ban concealed carry at an upcoming speech by Vice President Mike Pence at its convention, when it was actually the Secret Service that forced the organization to do so. Democrat shill Don Lemon (left); Democratic Governor Ralph Northam (in blackface (right). In first half of 2017, CNN's market share relative to its competitors saw a marked decline. In addition, it faced repeated losses of its credibility through its lapses of journalistic judgment and ethical lapses. President Donald Trump publicly says CNN produces "fake news" and he also told a CNN reporter that CNN produces "very fake news". Subsequently, CNN has been derided as being "FNN: Fake News Network". In May 2017, a CNN program claimed that Islam "has always been part of the American fabric" even as far back as the American Revolution, despite the apparent contradiction with the historical record. On March 28, 2018, CNN anchor Chris Cuomo falsely claimed that "no one [is] calling for Second Amendment repeal", even though, former Supreme Court Justice John Paul Stevens, among other left-wingers, had very recently and notably called for just that. Sometime before January 6, 2017, DNI James Clapper briefed opposition research talking points, manufactured by the Clinton campaign in the Steele dossier, to Jake Tapper of CNN. The salacious innuendo lacked verification and a " news hook" for CNN to report. Clapper instructed FBI Director James Comey to brief President-elect Trump on the allegations. Clapper immediately leaked the fact Trump had been briefed, creating the "news hook" CNN was looking for to publicize the existence of the Steele dossier. FBI counter-intelligence investigator Peter Strzok then used the fake news report to justify interviewing National Security Advisor Michael Flynn and lay a perjury trap, thwarting the new president's foreign policy agenda. Clapper was rewarded with a job at CNN afterward. In 2019, CNN falsely labeled liberal Democrat Virginia governor Ralph Northam a "Republican" when reporting a racist photo of himself while in medical school. The mainstream media has worked with the deep state intelligence agencies to promote fake news regarding the supposed Trump-Russia scandal,  and the alleged Russian hacking of John Podesta and DNC emails. Just when things looked desperate for Democrats with unhinged mobs responding to the party's leadership, CNN reported it had received a mail bomb addressed to John Brennan, who actually works for NBC. Nonetheless, CNN opened John Brennan's mail anyway, paused to take pictures of the alleged bomb resembling a Hollywood prop, before evacuating the building in a panic. Others received mailings as well. Republicans were quick to condemn political violence, unlike Democrat leaders, who were encouraging it. President Trump vowed to use all the resources of the federal government to find who was responsible. "tests have determined that a powder found inside an envelope delivered to CNN along with a pipe bomb was harmless." None of this stopped CNN and other mainstream sources from failing to clarify the facts, or whipping up anti-Trump hysteria. None of the bombs were active, and the alleged bomber didn't know how to build a bomb anyway. The alleged bombs lacked a detonator device, were made with PVC tubing instead of lead, and packed with a harmless powder. The actual question the researchers asked was, "At any time in (your child’s/your) life, (was your child/were you) in any place in real life where (he/she/you) could see or hear people being shot, bombs going off, or street riots?" So they mixed in "witnessed a shooting" with "heard a street riot", etc. When the term first came into common usages immediately after the 2016 elections, liberals, the mainstream media, and social media misapplied the term to make the false accusation that alternative news sources were "deliberately lying" to their readers, listeners, and viewers, and that these "lies" helped elect Donald Trump President of the United States. The liberal-pushed "fake news" accusations are a form of conspiracy theory. The mainstream media itself publishes and promotes fake news stories appearing in nightly network newscasts, on its cable news channels, in its newspapers and on its websites (including Facebook). When fake news sites misuse the "ABC News" logo or are designed to appear to be sponsored by a TV news channel, the mainstream media may also appear to publish and promote fake news stories. The mainstream media itself can be rife with government leaked fake news stories, such as a fictional Washington Post story that Russia hacked the U.S. power grid in 2016. While leftists accuse conservatives of being behind fake news stories, the evidence shows the exact opposite, although fake news is designed to appeal to audiences all across the political spectrum. Ishaan Tharoor, the author who wrote the piece, lets the reader know that he assumes Trump's election win is so surprising (although it wasn't) that any explanation deserves to be looked at if the event has not been fully explained already. This would allow the subject which follows—his allegations of "fake news" being epidemic as well as his suggestions that they were isolated to media outlets that weren't "real sources" (by some unstated body's estimation)—to be plausible or even to be considered an especially good candidate as an explanation (to the uninformed), despite being unfounded or at least founded on exaggeration. Facebook has also responded to the alleged problem by developing a system wherein readers can flag a post they find suspicious. Once flagged the post will be reviewed by a mainstream media representative, who decides whether the news is "real" or "fake." On January 14, 2016, the Snopes website, itself considered a fake news site by some experts, published its "Snopes’ Field Guide to Fake News Sites and Hoax Purveyors"
“deliberately presenting false information as news.” We differentiate this from disinformation, which we consider to be "deliberately spreading false information;" fake news is thus a subset of disinformation. We further distinguish it from misinformation, which we take to mean the unintentional spreading of false information. In 2018, the European Commission proposed the creation of an "independent fact-checking network" that would fight what it views as "fake news." However, this network, if created, would be funded by left-wing organizations connected to George Soros. "Undoubtedly the new main psyop against independent media is flooding the web with fake news, and mainstream media putting out fake news, and setting themselves up like a super-Snopes, to be the arbiter of what's real and what’s not," countered Alex Jones from Infowars in the wake of criticism of the Alternative Media on the part of Democrat presidential candidate Hillary Clinton supporters following Trump's win. Answers in Genesis President Ken Ham, noted that one of the most prominent and blatant examples of fake news is the media's treatment of evolution and an old Earth as undisputed scientific fact, even though numerous counterexamples exist to evolution and an old Earth. According to a 2017 Poynter Media Trust Survey, 44% of Americans believe the media creates "fake news" stories against Trump to make him look bad. A Monmouth University poll released in April 2018 found that 77% of Americans believe the mainstream media reports fake news. Melissa Zimdars, a far-Left professor had compiled a list of supposedly "fake and misleading" news websites that was heavily promoted in the Mainstream Media, including Breitbart, Infowars, Twitchy, The Blaze, and Bizpac Review. Even liberals, such as Will Oremus on Slate.com, criticized the list and the term itself for being far too broad, unfairly targeting numerous sites, and being an overreaction. Zimdars later removed her "Fake News" list, claiming she had been "harassed" and "doxed". A 2017 Yale University study found that flagging news stories as "fake news" is ineffective due to the general mistrust of the media by Americans that already exists. While liberals frequently accuse conservative or alternate media sites of being dishonest, they typically gloss over the massive failings of the mainstream media to accurately and fairly cover the news, as well as its own propensity to post and report fake news itself (such as the polls they released which falsely claimed that Hillary Clinton was "well ahead" of Donald Trump in the 2016 presidential election campaign in order to discourage conservative voters, despite the attendance figures of the Trump campaign rallies vs. the Clinton campaign rallies, which the mainstream media chose to ignore, proving otherwise). Although the polls may have correctly predicted Clinton's 3 million vote margin in the national popular vote, commenters ignored the fact that the election is determined state-by-state in the Electoral College. In fact, within days after Trump's victory in the election, Wikipedia's liberal editors propagated a far from neutral and heavily liberal-biased "Fake news website" article. ↑ Officials had determined within two hours, and the Associated Press reported that the alleged bombs were fake, however days later most prominent mainstream sources continued to allege the packages contained real bombs. ↑ Callan, Paul. Sue over fake news? Not so fast. Retrieved on April 6, 2017. ↑ The Great George Bush Sr. "Grocery Scanner" Urban Legend Lives On. Media Research Center. Retrieved December 5, 2018. ↑ Nicas, Jack (November 14, 2016). "Google to bar fake-news websites from using its ad-selling software". Wall Street Journal. 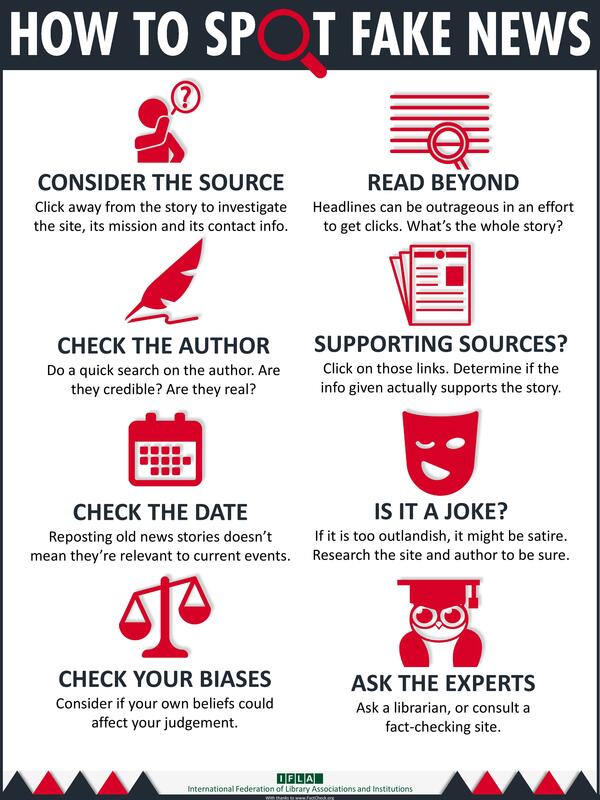 ↑ How to Spot Fake News (January 27, 2017). ↑ A prime example of Joseph Schumpeter's creative destruction. ↑ 22.0 22.1 Sydell, Laura (November 23, 2016). "We Tracked Down A Fake-News Creator In The Suburbs. Here's What We Learned." NPR. Retrieved December 8, 2016. ↑ Dewey, Caitlin (November 17, 2016). Facebook fake-news writer: ‘I think Donald Trump is in the White House because of me’. The Washington Post. Retrieved December 8, 2016. ↑ Facebook Live attack the latest in string of anti-Trump assaults. Fox News. January 5, 2017. Retrieved January 8, 2017. ↑ Pollak, Joel (March 29, 2017). Donald Trump Vindicated: Antisemitism Surge ‘Fake News’. Breitbart News. Retrieved March 29, 2017. ↑ Heinlein, Peter (May 30, 2017). Trump Frustrated by 'Fake News' That Overlooks His Accomplishments. Voice of America. Retrieved June 26, 2017. ↑ 27.0 27.1 Facebook is still figuring out how to tackle fake news. Tech Crunch (Feb 14, 2017). Retrieved on June 29, 2017. ↑ 28.0 28.1 Barron, Rachel. "Even News Sites Fall for Fake News", American Journalism Review, April 3, 2017. Retrieved on June 29, 2017. ↑ Greenwood, Mark (February 17, 2017). Trump tweets: The media is the 'enemy of the American people'. The Hill. Retrieved February 27, 2017. ↑ Spiering, Charlie (November 27, 2017). Donald Trump Proposes ‘Fake News Trophy’ for TV Networks and CNN. Breitbart News. Retrieved November 28, 2017. ↑ Fabian, Jordan (November 27, 2017). Trump: Media should compete for 'FAKE NEWS TROPHY'. The Hill. Retrieved November 28, 2017. ↑ Moran, Sean (June 23, 2017). Fake News: Washington Post Invents Meeting Between FCC Chair Ajit Pai and President Trump. Breitbart News. Retrieved June 24, 2017. ↑ Mason, Ian (June 30, 2017). New York Times: Turns Out ‘17 Intelligence Agencies’ Was Fake News. Breitbart News. Retrieved July 1, 2017. ↑ Klein, Aaron (July 1, 2017). Fake News: Associated Press Clarifies 17 U.S. Intel Agencies Did Not Assess Russia ‘Interference’. Breitbart News. Retrieved July 1, 2017. ↑ Poor, Jeff (July 7, 2017). Fmr Obama DNI Clapper: Only 3 or 4 Intelligence Agencies Agreed on Russian Interference — ‘It Wasn’t 17’. Breitbart News. Retrieved July 7, 2017. Flood, Brian (May 29, 2018). Embarrassment for New York Times as top editor falls for old photo amid weekend of misleading anti-Trump tweets. Fox News. Retrieved May 29, 2018. Starr, Penny (May 30, 2018). ACLU, NPR Use 2014 Immigration Claims to Trash Trump Policy. Breitbart News. Retrieved May 30, 2018. Mikelionis, Lukas (May 28, 2018). Former Obama official, liberal activists share 2014 photos from detention facility as swipe at Trump. Fox News. Retrieved May 29, 2018. Spiering, Charlie (May 29, 2018). Donald Trump Rips Democrats for Tweeting Border Pictures from 2014. Breitbart News. Retrieved May 29, 2018. ↑ Scarry, Eddie (June 21, 2018). AP report on alleged illegal immigrant abuse at detention centers omits Obama was president at time. Washington Examiner. Retrieved June 21, 2018. ↑ Binder, John (June 1, 2018). Establishment Media Issues Four Corrections After Falsely Claiming Trump Separating Families at Border. Breitbart News. Retrieved June 2, 2018. ↑ Nolte, John (July 9, 2018). Associated Press Becomes Fake News Factory with Immigration Lies. Breitbart News. Retrieved July 9, 2018. ↑ Scarborough, Rowan (June 8, 2017). James Comey debunks New York Times story that fueled unproven Trump-Russia collusion. The Washington Times. Retrieved June 9, 2017. ↑ Pollak, Joel B. (June 7, 2017). James Comey Testimony Proves Trump Right, CNN Wrong. Breitbart News. Retrieved June 9, 2017. ↑ Boyle, Matthew (June 23, 2017). Very Fake News: After Breitbart Investigation, CNN Retracts Conspiracy Theory Hit Piece Attacking Trump, Associates Over Russian Fund. Breitbart News. Retrieved June 24, 2017. ↑ Boyle, Matthew (June 24, 2017). CNN Under Fire: ‘Very Fake News’ Network Hit from All Sides as Breitbart Investigation Forces Rare Retraction. Breitbart News. Retrieved June 25, 2017. ↑ Boyle, Matthew (June 26, 2017). Three Employees Resign from CNN Amid Very Fake News Scandal. Breitbart News. Retrieved June 27, 2017. ↑ Adams, Becket (June 26, 2017). Three CNN staffers quit over retracted story. Washington Examiner. Retrieved June 27, 2017. Munro, Neil (August 30, 2018). State Dept. Slams WaPo Claim Texas Latinos Are Being Denied Passports. Breitbart News. Retrieved September 18, 2018. Munro, Neil (September 17, 2018). Washington Post Busted for Fake News of Trump Admin ‘Denying Passports’ to Latinos. Breitbart News. Retrieved September 18, 2018. Adams, Becket (September 17, 2018). The Washington Post's 'scoop' on Trump revoking visas at the border — it was a pile of garbage. Washington Examiner. Retrieved September 18, 2018. ↑ 49.0 49.1 Stoltzfoos, Rachel (September 18, 2018). Legacy Outlets Add Two More Botched Hit Pieces To A Pile Of Stinky Reporting On Trump. The Federalist. Retrieved September 18, 2018. Flood, Brian (September 14, 2018). New York Times admits creating 'unfair impression' about Nikki Haley's $53G curtains that were OK'd by Obama administration. Fox News. Retrieved September 18, 2018. Nolte, John (September 14, 2018). New York Times Spreads Fake News About Nikki Haley’s $52,701 Curtains. Breitbart News. Retrieved September 18, 2018. ↑ Miller, S.A. (December 30, 2018). 'Fake news' a real problem long before Trump era, media watchdogs say. The Washington Times. Retrieved December 31, 2018. ↑ 52.0 52.1 Snopes’ Field Guide to Fake News Sites and Hoax Purveyors (January 14, 2016). Retrieved on April 4, 2017. ↑ "How Russian Twitter Bots Pumped Out Fake News During The 2016 Election", NPR, April 3, 2017. Retrieved on April 4, 2017. ↑ "Russia spread fake news during Dutch election: report", Politico, April 4, 2017. Retrieved on April 4, 2017. ↑ "Did a Judge Rule That CNN Is 'Fake News'? ", Snopes, Feb 17, 2017. Retrieved on April 5, 2017. ↑ Hayward, John (February 8, 2017). Fake News: DHS Secretary Calls WaPo ‘John Kelly-Steve Bannon Feud’ a ‘Fantasy Story’. Breitbart News. Retrieved May 18, 2017. ↑ Boyle, Matthew (June 30, 2017). Fake News: Associated Press Engulfed in CNN-Level Scandal as It Covers Up Invention of Imaginary Pruitt Meeting. Breitbart News. Retrieved July 1, 2017. ↑ Mason, Ian (November 27, 2017). WaPo Forgets Kushners Came Up with ‘Mr. Perfect’ on Their Own. Breitbart News. Retrieved November 27, 2017. ↑ Rodriguez, Katherine (November 26, 2017). Fake News: Morning Joe Caught Pretending Pre-Taped Day After Thanksgiving Show Was Live. Breitbart News. Retrieved November 27, 2017. Hawkins, Awr (April 30, 2018). Fake News: AP, WaPo Claim NRA Bans Guns at Mike Pence Speech. Breitbart News. Retrieved April 30, 2018. Adelmann, Bob (May 1, 2018). More Fake News: NRA Bans Guns at Its Own Convention! The New American. Retrieved May 1, 2018. Richardson, Bradford (April 30, 2018). AP issues correction on report that NRA banned guns for Mike Pence speech. The Washington Times. Retrieved April 30, 2018. Concha, Joe (April 30, 2018). AP corrects earlier report that NRA banned guns at Pence speech. The Hill. Retrieved April 30, 2018. ↑ Death Spiral: Along With Its Credibility, CNN Ratings Collapse, Daily Wire, 2017. Tucker: When did CNN become internet morality police? ↑ Trump to CNN: "Very Fake News"
↑ Pollak, Joel B. (May 29, 2017). CNN’s W. Kamau Bell: Islam Part of America’s Founding. Breitbart News. Retrieved May 29, 2017. Nolte, John (March 28, 2018). Fake News: CNN’s Cuomo Says ‘No One Calling for 2nd Amendment Repeal’ (They Are). Breitbart News. Retrieved March 28, 2018. Kugle, Andrew (March 28, 2018). CNN’s Cuomo: No One Is Calling for Repeal of Second Amendment. The Washington Free Beacon. Retrieved March 28, 2018. Adams, Becket (March 28, 2018). CNN host apparently unaware that people have indeed called for the repeal of the Second Amendment. Washington Examiner. Retrieved March 28, 2018. ↑ Russian Active Measures in the 2016 Election, House Permanent Sub Committee on Intelligence, March 22, 2017, pp. 107-108. ↑ Clapper Leaks Twice to CNN. Brennan Stands in the Shadows. A Russian Narrative is Born, Jeff Carlson, April 27, 2018. ↑ Gualtieri, Allison Elyse (February 2, 2019). CNN misidentifies Virginia Gov. Ralph Northam as a Republican during his apology for racist yearbook photo. Washington Examiner. Retrieved February 2, 2019. ↑ Rodriguez, Katherine (February 1, 2019). WATCH: CNN Chyron Labels Virginia Gov. Ralph Northam a Republican. Breitbart News. Retrieved February 2, 2019. ↑ Jasper, William F. (April 25, 2017). Deep State and Fake News. The New American. Retrieved January 3, 2018. ↑ 7:50 p.m. A law enforcement official says tests have determined that a powder found inside an envelope delivered to CNN along with a pipe bomb was harmless. The official wasn’t authorized to discuss the investigation publicly and spoke to The Associated Press on condition of anonymity. New York City’s police commissioner said earlier Wednesday that the package sent to CNN’s offices in Manhattan contained a live explosive and an envelope containing white powder. The FBI said the package was similar to explosives sent to former President Barack Obama, Hillary Clinton, former Attorney General Eric Holder and billionaire George Soros. The package sent to CNN was addressed to former CIA Director John Brennan, a frequent guest on the channel. The official says that parcel contained no note or claim of responsibility. cd5023f89feca Tom Hays, Associated Press, October 24, 2018. ↑ "Breitbart Duped by Fake News (Again)", Snopes, September 1, 2016. Retrieved on April 5, 2017. ↑ Leetaru, Kalev, "'Fake News' And How The Washington Post Rewrote Its Story On Russian Hacking Of The Power Grid," Forbes, Jan 1, 2017. ↑ Tomlinson, Chris (April 28, 2018). European Union Advocates For Soros-Funded ‘Independent Fact Checkers’ to Combat ‘Fake News’. Breitbart News. Retrieved April 28, 2018. ↑ Ham, Ken (March 21, 2017). The Real Fake News. Answers in Genesis. Retrieved March 21, 2017. ↑ Richardson, Bradford (December 28, 2017). ‘Fake News’: Half of all Americans believe the media make up anti-Trump stories. The Washington Times. Retrieved December 29, 2017. Manchester, Julia (April 2, 2018). More than 3 in 4 believe traditional media reports ‘fake news’: poll. The Hill. Retrieved April 2, 2018. Persons, Sally (April 2, 2018). Over 70 percent of Americans see media as ‘fake news,’ a Monmouth University poll shows. The Washington Times. Retrieved April 2, 2018. Church, Nate (April 2, 2018). Poll: 77 Percent Believe Traditional Media Guilty of Fake News. Breitbart News. Retrieved April 2, 2018. Lima, Cristiano (April 2, 2018). Poll: 77 percent say major news outlets report 'fake news'. Politico. Retrieved April 2, 2018. Byas, Steve (April 4, 2018). Poll: Public Convinced That Media Reports Fake News to Advance Their Own Agenda. The New American. Retrieved April 4, 2018. ↑ Oremus, Will (December 6, 2016). Stop Calling Everything “Fake News”. Slate.com. Retrieved December 8, 2016. ↑ Church, Nate (September 12, 2017). Study: Flagging Stories as ‘Fake News’ Ineffective; People No Longer Trust Media. Breitbart News. Retrieved September 13, 2017. ↑ "Fake news website" article at Wikipedia, December 2, 2016. Fakehatecrimes.org. A database of reported instances of fake hate crimes. This page was last modified on 19 April 2019, at 13:16. This page has been accessed 53,334 times.